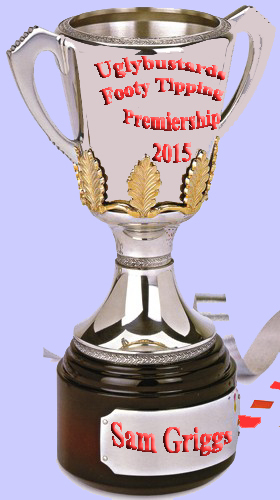 The 2015 Uglybustards Premiership Cup proudly brought to you by Huru Sports, look good play better. The Hawks may have got their 3-peat but it was Sam Griggs who got his 2nd Uglybustards Champeenship on the first Saturday in October. He joins an elite group of Uglybustards dual titleholders that consists of Arnold Layne (2000, 2010), Denis Lashmar (2005, 2008) and Sam (2013, 2015). 2013 Uglybustards Champeen Sam Griggs has edged out the Ox for the 2015 minor premiership. With yet another high number of upsets on the round 23 weekend, the Ox's final Joker didn't pay off and Sam scored well to take a 4 point lead into the finals. 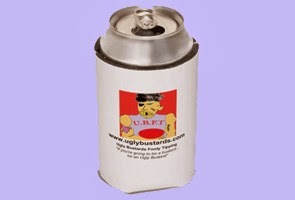 For the first time in Uglybustards history we may not have a jackpot. More on that later, along with a callout to Tax Dodgers. Never mind its 20 years too late, the (once) mighty Blues finally look to be re-shaping a treat with Juddy out the door straight after Malt, and his love child Daisy following with a buggered shoulder. With Ange Postecoglou on the Coach Selection Committee we could see a Ned Zelic comeback any time soon. Meanwhile the Horse Longmire is so spoilt he throws the toys outa the cot when five goals up and isn't it criminal that drug cheat Crowley remains eligible for the 2015 Grand Final!